A number of buyers and sellers in the realty market come in contact with each other using web technologies. Nowadays, property websites have a greater contribution in providing a firm base for the transactions taking place in the global real estate industry. These websites have become an integral part of the property market worldwide. We, at WeblinkIndia.Net, are the experts in design and development of property websites and our solutions have been enriching the experience of users across the industry. Property Website Development has become a lucrative venture with millions of property buyers and sellers turning to the internet to fund listings. The property dealers have followed suit, adding fuel to the supply for this demand. But for such a property portal to be successful, one needs to have the best development and management services for creation of a distinct identity amidst the online competition. With WeblinkIndia, you get the latest and the innovative solutions as our experts keep themselves abreast of the latest software technologies. Through scripting, content management systems and other software, you get compelling graphics, easy to use functions, scalable website systems, and robust architecture from us. At WeblinkIndia, you not only get a business platform for property dealings, but also receive full assistance in increasing business traffic as well as its credibility in the market. With our property website, you can easily manage your database, with easy tracking of registered members and website traffic. Our expert team of professionals creates a separate admin panel so that you can easily manage the website with all the facilities. Signage Search is an India-based company engaged in the business of selling a wide number of products and organizing diverse trade shows & events. We deal in varied categories like custom signage, LED scrolling, way finding, safety signage, promotional signage, traffic signage, exhibition signage, channel letters, architectural signage, gift items, exhibition signage, LED video wall, and several others. You can also advertise your products/ services with us. Visit our website for more info. It is designed, developed, and managed by WeblinkIndia.Net. Energy & Industrial Solutions, an ISO 9001: 2008 company, launched its business operations in the State of Qatar as an Engineering Services Company. We cater to the requirements of various domains such as Oil & Gas, Petrochemical, Industrial, Power, Construction and Civil. Within a very short span, we have carved a niche for ourselves in the promising markets of United Arab Emirates and Sultanate of Oman. WeblinkIndia.Net Pvt. 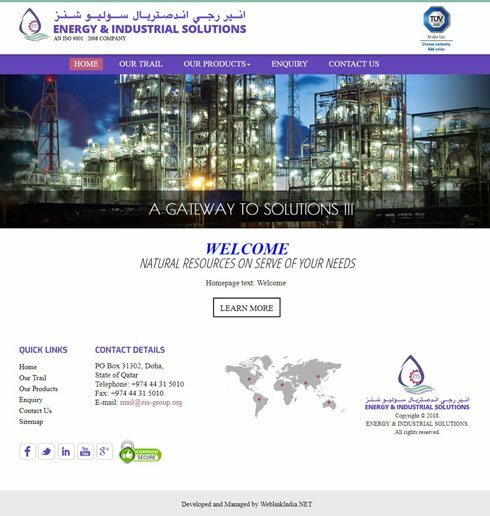 Ltd. has designed and developed the website for Energy & Industrial Solutions. Satvik Jewellers is one of the distinguished jewelry virtual stores with a large catalogue of jewelry designs and related products. Some of our products include diamond rings, gold coins, royal coins, wedding rings, stones, gold chains, and various other products. Moreover, we offer various convenient payment options to our esteemed customers. Some of these secure payment options are PayPal, Maestro, Visa, Master Card, and various others. The website of Satvik Jewellers is developed and managed by an India-based E-commerce company named WeblinkIndia.Net Pvt. Ltd.
Bab Al Sahraa Hardware & Bldg Mat. Based in Sharjah (United Arab Emirates), Bab Al Sahraa Hardware & Bldg Mat Tr. Deals in all kind of furniture fittings, glass fittings, aluminium accessories, abrasive, power tools, hand tools, electricals, sanitary, safety items, SS & GI fasteners, and all kind of hardware and building materials. We ensure that our products excel in quality while being affordable. 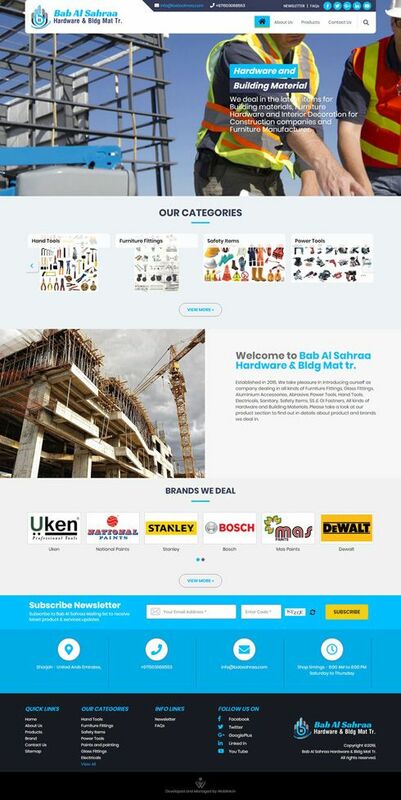 The website of Bab Al Sahraa Hardware & Bldg Mat Tr. has been developed, designed, and managed by an E-commerce web development organization based in New Delhi, India, namely WeblinkIndia.Net. Choose WeblinkIndia For Property Website Development – Here’s Why?